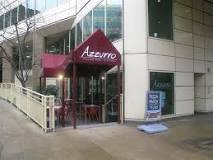 Azzuro is an Italian restaurant near London Bridge Station in London, England is on the main road and is easy to find. 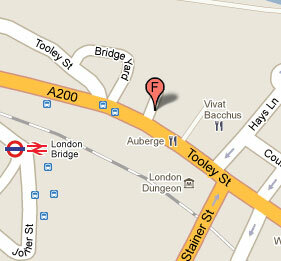 Azzurro is located on Tooley Street, opposite the entrance to the London Dungeon. It is a modern restaurant is open from midday until late seven days a week, serving top quality, freshly prepared, great value, Italian food. The downstairs bar comes to life in the evening and has a daily happy hour in the bar between 5pm and 8pm. It is a veritable tardis. Azzuro looks tiny from the street, but it seems quite roomy when you get inside. My husband and I joined our daughter and son-in-law for dinner there when we were visiting the big smoke recently. It is always good to see them. The restaurant was warm and the tables are not too close together. Also, the restaurant was not too noisy. We could have a conversation. However, it was busy and I would recommend booking a table. The lavatories are downstairs where there was a bar with music and lots of atmosphere. There are also stairs to get to different parts of the restaurant, so I would not recommend Azzuro to those with physical disabilities or mobility problems. The staff in the restaurant were very polite and efficient and the menu is large and varied. Drinks arrived quickly and we did not have to wait too long for our meals. We started with a selection of black and green olives and breads to share. They really were delicious and the breads included onion bread, tomato bread, garlic bread and whole grain varieties too. My husband is not that fond of olives, so he chose the bean soup. It was very thick and hearty with a wide variety of vegetables and beans in it. He really did enjoy it. Our main courses were all different. My daughter chose a pasta dish, while my son-in-law had a pizza. They had had busy days at work and I was glad to see them both tucking into their dinner. My husband chose a steak. He was delighted because it was cooked exactly the way he likes it and it was very tender. I was not so keen on my vegetarian rissotto. It sounded much more interesting than it was. Even black pepper and parmesan cheese could not save it. Still, three out of four ain’t bad! We finished up with a selection of teas and coffees. There is a wide variety of tea and the coffee is a delicious blend. The restaurant offers good food, a friendly ambiance and excellent value for money. I would certainly visit Azzurro again, but I will not have the vegetarian risotto.